Tiny 'Nux Tarot (TnT) is a french tarot game. Its main feature is to allow to play tarot even when you don't have friends. Latest version is 0.3. TnT is written in Vala, uses the Gtk+ library, and is released under the GNU General Public License. 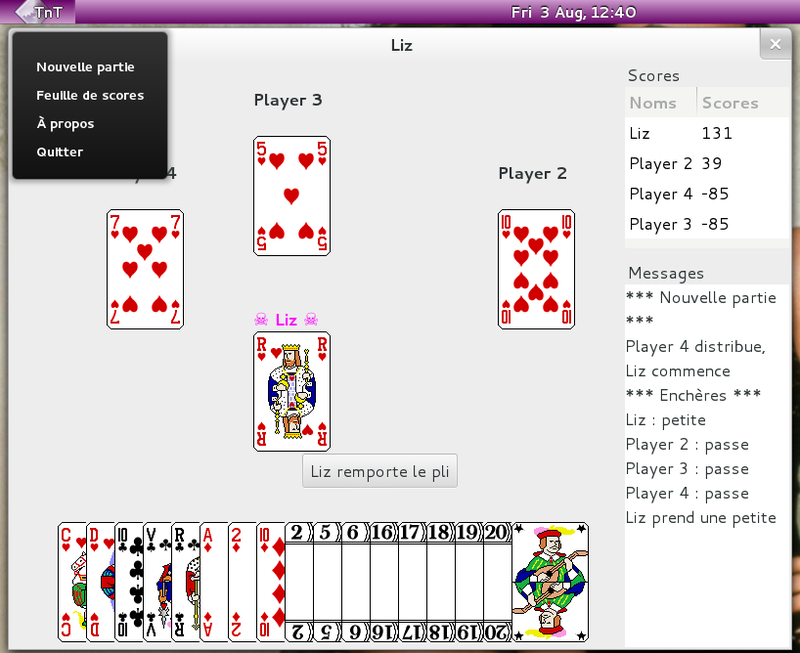 Basic tarot rules implemented, though special cases are missing ("poignee", "misere", "petit au bout"). Possibility to have multiple human players on the same computer, though that's not really that useful. If you want to compile, you will also need the usual tools: gcc, and make. Currently, Tiny 'Nux Tarot is not available in distribution repositories, but I try to make Debian packages and would gladfully host other packages. If you are under Debian, you can look at the download page and see if there is a package that fits your architecture. Note: as Vala source files are already precompiled in C, you won't need a Vala compiler in order to achieve this. If everything goes well, all you have to do now is launch tnt, either by the command line or from the menu. In this case, you will additionally need the Vala compiler and yelp-tools. should launch a new game if you just installed it, or resume your previous game if you already played (only the scores are saved at the end of each game, though). GUI is pretty basic: click on a card to play it or select/unselect it for your dog. Click the "OK" button at the end of the turn. The name of the player name who took is displayed in red (with skulls), the name of the one who won the precedent turn is displayed in blue. Some messages also appear at the right to give you some information about who distributes or what are the bids and scores. TnT now checks for error when loading card pictures, and can be runned without being installed. "Garde sans" and "Garde contre" are now handled. A table of score is now displayed instead of just a string. Excuse is now handled correctly. Possibility to resume game and gets the same scores. Enhanced IA, which can now take. Minor enhancements to the GUI.